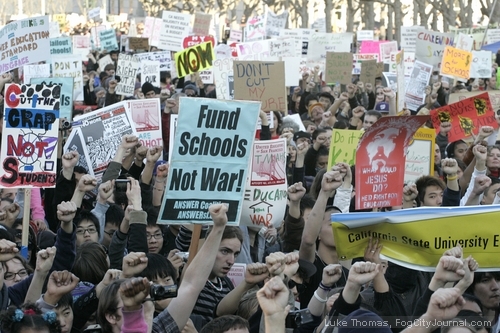 Several groups including OccupySF will combine forces March 1st for a statewide, non-violent, coordinated day of direct action with a rally outside the State building in San Francisco to demand that cuts to public education and social services are fully restored. File photo by Luke Thomas. On March 1, 2012, San Francisco occupiers, educators, students, community members, and unions will unite for a Statewide Day of Action to demand that the California Government fully funds public education and social services for the 99%. The Statewide Day of Action will lead to a five-day “99 Mile March for Education and Social Justice” from Oakland to Sacramento, and a convergence of hundreds of people on March 5th to nonviolently occupy the State Capitol in Sacramento. David Solnit, from the Occupy San Francisco Direct Action Working Group, explains that, by holding a teach-in within the State Building, the 99% is educating legislators and occupying a political system that provides the 1% with tax loopholes, and allows the 1% to transfer the 99%’s money out of education, and into bank bailouts. “I’m asking people to come out and support public education on March 1st and March 5th because, as a teacher working in San Francisco public schools, I’ve had enough of furlough days, lay off notices, class size increases, and cuts to educational programs and infrastructure,” said Andy Libson a science instructor at Mission High School. “As a student, I’m seeing the public university system being dismantled around me. Many of my fellow students are either being priced out of school or having to take on massive amounts of debt; even while working. We are paying more and more for less and less, and when we finally graduate, there are few job prospects for us,” said Terence Yancey, a philosophy major at San Francisco State University. When: March 1, 2012 – Teach-in at 3:00 p.m.; Rally at 4:00 p.m. 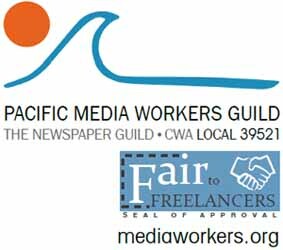 The San Francisco Day of Action is endorsed by dozens diverse groups including AFT Local 2121; California Faculty Association (SFSU); Chinese Progressive Association; CODEPINK Bay Area; SF Jobs with Justice; Bay Area Labor for Peace and Justice; La Raza Centro Legal; Occupy Bernal; Old Lesbians Organizing for Change SF Bay Area Chapter; San Francisco Labor Council (AFL-CIO); SF Occupy Solidarity Network; SEIU Local 1021; United Educators of San Francisco; Young Workers United, Occupy CCSF, Occupy SFSU, and Occupy San Francisco. to Restore Education, Social Services Funding are now closed.